War – Woody won rapid promotion to to Lieut-Commander R.N.V.R. as a naval expert on Radar, with postings in England, France, Belgium & Germany. 1946 – Joined Percy Corry as Assistant Manager of the Northern branch of Strand Electric. ?1950 – Moved to London to head the ‘Sales Other’ department. 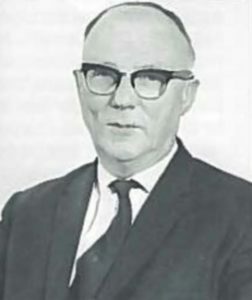 1959 – Became Manager of the Export Department. 1985 – Woody passed away. Memorial service was held in Littleton, Surrey.